Sat., June 23, 2018, 9:55 a.m.
Tri-City 5, Spokane 3: Olivier Basabe reached via error then scored the go-ahead run on a sacrifice fly in the seventh inning and the Dust Devils (5-3) topped the visiting Indians (2-6) at Gesa Stadium on Friday. The Indians (2-6) were swept in the three-game set. Jake Latz struck out nine over 5 2/3 innings but Royce Bolinger fell to 0-3 as he allowed two unearned runs on three hits and a walk over 2 1/3 innings. Tri-City set an all-time record for attendance at 3,830. Salem-Keizer 7, Boise 1: Norwith Gudino allowed one run on five hits over five innings and the visiting Volcanoes (6-2) beat the Hawks (3-5). Robinson Medrano homered while Ricardo Genoves and Dalton Combs drove in two runs apiece. 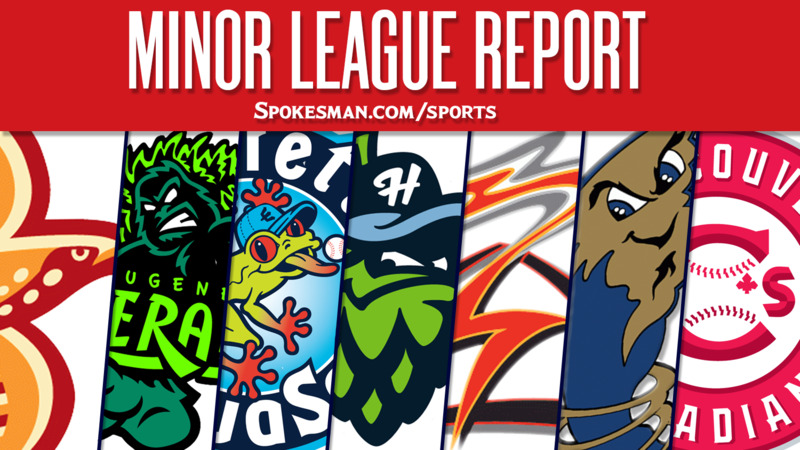 Eugene 6, Hillsboro 2: Jonathan Sierra and Christopher Morel homered and the visiting Emeralds (5-3) topped the Hops (4-4). Sean Berry (1-0) got the win, striking out four over 1 1/3 innings. Everett 4, Vancouver 2: Cameron Perkins went 2 for 4 with a two-run home run and three RBIs and the visiting AquaSox (5-3) beat the Canadians (2-6). Connor Kopach went 2 for 5 and scored three runs while Jake Anchia went 2 for 4 and drove in a pair. Round Rock 3, Nashville 2: Andy Ibanez drove in Tommy Joseph from second in the eighth inning to help the visiting Express (31-42) edge the Sounds (33-38). Starter Adrian Sampson gave up two runs – one earned – on three hits and a walk with four strikeouts over six innings. Corpus Christi 4, Frisco 0: Eduardo de Oleo smacked a two-run home run and the Hooks (47-36) topped the visiting RoughRiders (26-48). Four Hooks pitchers combined on the seven-hit shutout. Winston-Salem 8, Down East 2: Blake Rutherford went 3 for 4 with a two-run homer, four RBIs and a stolen base and the Dash (43-29) downed the visiting Wood Ducks (35-37). Ti’Quan Forbes added a solo shot for Winston-Salem. West Virginia 6, Hickory 4: Leadoff hitter Oneil Cruz went 3 for 5 with two runs and an RBI and the visiting Power (39-29) powered past the Crawdads (30-40). Yohel Pozo collected a pair of hits for Hickory. Published: June 23, 2018, 9:55 a.m.